In addition to cooking all weekend, I also did some baking. GB and I have been working really hard at eating healthy so I've had to put baking on the back burner. Even though I make a lot of mistakes in the kitchen, I love baking. I was happy to have the mixer back in hand. I searched on Pinterest for a chocolate peanut butter cookie recipe and found an enticing version on Bake or Break. For the full recipe, click here. The recipe requires minimal ingredients which is a big plus for me. I whisked together 1 and 1/2 cups of flour, 1/2 cup of cocoa, 1/2 teaspoon of baking soda and 1/4 teaspoon of salt. In another bowl, I combined a stick of butter, 1/2 cup of sugar, 1/2 cup of brown sugar, and 1/4 cup of peanut butter. Next I added one egg, 1 teaspoon of vanilla, and 2 tablespoons of water. Next I combined the dry and wet ingredients. I always fear this step in baking because the flour always manages to end up on my face, the counter and the floor in addition to the batter. I chopped what Reeses peanut butter cups I had on hand leftover from my sister's birthday party. After the candy was thoroughly mixed in, I formed the batter balls. I baked the cookies at 375° for 7-9 minutes. Clearly, I baked the cookies a little too long. The first clue that I should have taken the cookies out sooner was the big cloud of black smoke that emanated from the oven as I opened it. My suspicions were right, the cookies were badly burnt. The bad news: the cookies were completely inedible. The good news: my healthy eating kick wouldn't be affected. 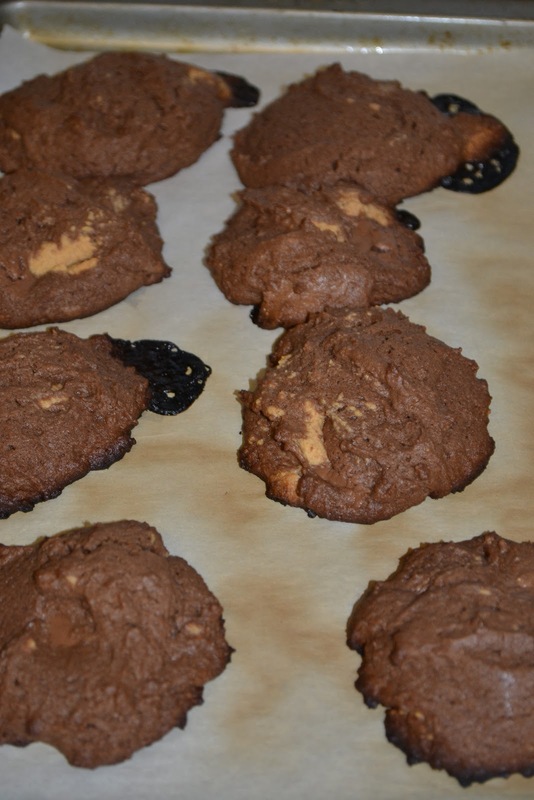 Luckily, one pan of four cookies survived the fiery inferno that was the oven. I was thrilled to at least get a taste of the cookie. Verdict? GB loved the cookies and ate all four within 12 hours. I was only able to get one bite in. The cookies were light, fluffy and not overbearing. I prefer my chocolate to be served in the form of silence-inducing awe. But if you are someone who prefers a lighter tasting chocolate or sweet, this cookie is for you! I always bake just one to check the timing, all ovens are not created equal!